In Congregation and Campus, the fullness of the Baptist experience in Christian higher education is explored, charted, and analyzed. 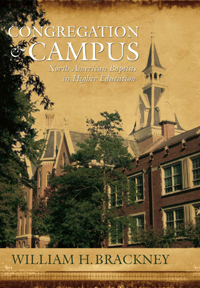 Beginning with the establishment in 1756 of the Academy and reaching to the present, the author explores the need for Baptists to pursue education and the types of schools they founded. Included are colleges, universities, manual-labor schools, literary and theological institutions, theological schools, and Bible colleges. Special attention is given to women and higher education and black Baptist achievements. Details are provided about what makes a Baptist school Baptist: charters, trustees, presidents, support, church accountability. The major examples of each type are woven together into an integrated narrative involving Northern, Southern, Freewill, independent, black, fundamentalist, and Landmarkist strands. In many instances, Baptists can rightly claim pioneering status, notably in women’s education and among the black Baptist traditions. In other instances, Baptists were imitators of groups like Congregationalists and Presbyterians. Towering above all other achievements was the University of Chicago that brought Baptists into the forefront of American higher education. Readers will note the attention given to Canadian developments, as the author’s North American orientation shines through. The interrelationships between the Canadian and American Baptist communities cannot be denied. Chapters at the end of the typological and chronological narratives ponder the meaning of denominational education at present, with suggestions about the future of “faith-based” institutions and the failure of contemporary literature to attend properly to Baptist idiosyncrasies.